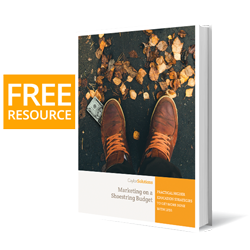 Are You Using Print and Digital Together in your Higher Ed Marketing? Ranker.com lists the best duos of all time (https://www.ranker.com/list/best-duos-of-all-time/ariel-kana). In the top five include some of the favorites from my childhood: Tom & Jerry, Batman & Robin and Hans Solo & Chewbacca. It is hard for me to imagine just one of those without the other. Duos just don’t work without working off of each other for the best effect. Today’s higher ed marketing landscape has a similar successful duo: Print & Digital. Just like the successful pairs of history, proper marketing requires complimentary use and recognition of unique strengths of both. [The cost of our program was] over $300 million. At one point, 50% of the CDs produced worldwide had an AOL logo on it. We were logging in new subscribers at the rate of one every six seconds. Any marketer can see the success of converting new clientele every six seconds. But the success of that program, as well as what we can do today with all aspects of marketing, is in working the strengths of each half of the duo and using each to complement the other. As in the case of AOL, schools need to leverage the power of both print and digital; it is not an “either/or” but a both. 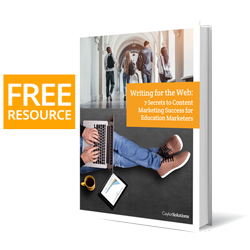 As you plan out your higher ed marketing and communications, be sure to consider the strengths of each. Since Gutenberg invented the press, printing has provided the power of communications through personal, hand-held documents to convey ideas and information. Unlike the sometimes temporal nature of digital media, printed materials have what I call a “stickiness” factor – they tend to stay around and are reviewed and engaged with in multiple times with multiple individuals. Printed college viewbooks and direct mail have the “kitchen counter factor:” repeatedly reviewed by prospective students and the parent influencers. When properly designed and executed, these materials can not only market the school’s information and distinctive benefits, but can tacitly communicate the brand through the use of high quality printing. Digital and online strengths include the immediacy, the ability to engage in conversation and rich media beyond the limits of a printed page. Platforms such as social media lend themselves to engagement and relationship-building with prospective students and parents. With the ability to answer questions and provide immediate support, digital marketing and communication provide tools that are revolutionary in today’s market place. Recent statistics show that nearly 60% [https://www.nielsen.com/us/en/insights/news/2010/global-online-shopping-report.html] of a buying decision is made before the first connection. Having the correct balance of print and digital marketing can assure that your first impression is your best. PURLS: Work with your Edal print services provider to assure that they can provide PURLS (personal URLs) for your printed materials. Personalization through variable data printing as well as a personal website for the call-to-action will provide you with trackable data and successful conversions. Trackable URLs and Telephone Numbers: In addition to PURLS, the use of trackable web addresses and trackable telephone services such as com and CallRail.com on the printed materials will assure accurate metrics for your marketing channels. Business Cards with Digital Contact Information: Be sure to include twitter handles, me profiles, email addresses, and other digital contact information on all personal stationery. QR for Rich Media: QR (quick response) codes can provide immediate access to rich online content from printed materials. Remember to customize these graphics to reflect your brand [https://mashable.com/2011/04/18/qr-code-design-tips/]and link them to video and other media content that enhances and expands the printed materials [https://technologyinearlychildhood.com/2013/10/28/using-qr-codes-share-videos-parents/]. Call to Action: Within digital media such as websites, social media, or email; be sure to offer printed fulfillment as the call-to-action. By providing electronic documents as an immediate response, the printed material can be sent within the next day and arrive to them as a complete package to enhance and reinforce the brand and engagement decision. Be sure to include the next call-to-action on the printed material to complete the cycle. How are you using the dynamic duo of marketing? Leave your comments below.